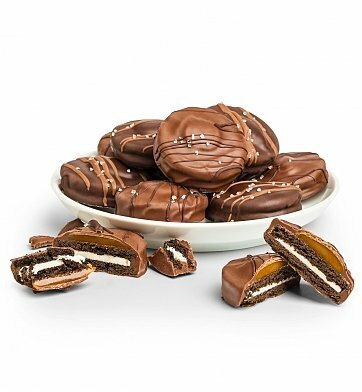 One dozen Oreos are doused in layers of creamy caramel, milk and dark Belgian chocolate, and sprinkled with coarse European sea salt. Everyone will love this epicurean spin on the traditional Oreo cookie! 12 Caramel Sea Salt Oreo® Cookies. if ordered by 3:00 am EDT Monday April 29th. Sea Salt Caramel Oreo® Cookies is a hand delivered gift. These gifts are delivered by one of our local design centers located throughout the United States and Canada. Same day delivery is available for most gifts when ordered before the cutoff time. The cutoff time for Sea Salt Caramel Oreo® Cookies is in the recipient's time zone. One dozen chocolate-covered caramel sea salt Oreo cookies. I gave these to someone who is receiving chemo, as a cheer me up present. They LOVED them!!! Thought they were the best tasting cookies!!! They shipped 5 days earlier then what the order told me.